GC Resident Evil 2 (USA) "Leon A" in 42:43.43 by Uroboros. Resident Evil 2, known in Japan as Biohazard 2 is a 1998 survival horror video game originally released for the PlayStation. 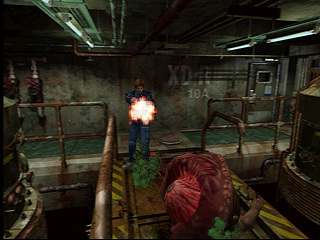 Developed by Capcom as the second installment in the Resident Evil series, its story takes place two months after the events of the first game, Resident Evil. This run beats Scenario A of the GameCube version of the game, that features support for the vibration and analog control functions, as well as a new unlockable minigame called "Extreme Battle", and a "Rookie" mode that enables the player to start the main story with a powerful weapon that features infinite ammunition.